Critical thinking remains a key issue for nurses and nurse managers. When asked what nurse managers struggle with the most, a lack of critical thinking consistently ranks near the top of the list. 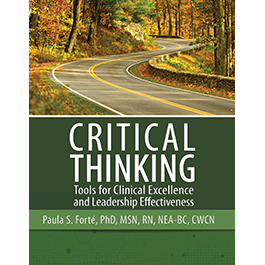 Critical Thinking: Tools for Clinical Excellence and Leadership Effectiveness provides the tools for nurses to help themselves and their staff improve their thinking and communication skills with both colleagues and patients. This new book is geared toward mid-career nurses, newly promoted nurse managers, and nurses who are at a critical point in their career. Paula S. Forté received her BSN from Dallas Baptist College (now, University) in 1975. She completed her MSN at Indiana University, Purdue University at Indianapolis (I.U.P.U.I.) in 1979 and her PhD in Adult Education and Organizational Development at Indiana University, Bloomington in 1984. She completed a post-doctoral fellowship in Nursing Administration Research with a focus in Nursing Informatics at the University of Iowa followed in 1998. She has worked in many roles including clinical service for both pediatrics and adult care, nursing administration and educational leadership, and currently coordinates the ANCC Magnet Recognition Program® journey for two hospitals in Minnesota. Chapter 4: What Guides Good Thinking?